Didn’t check off my bucket list goal to have a Cherplumple, but this pumpecapple from Three Brothers Bakery was pretty good, especially the pecan / chocolate part. I saw that recently too! I want to find a recipe and recreate it next year! Goodness my retinas can taste that. Wha…? 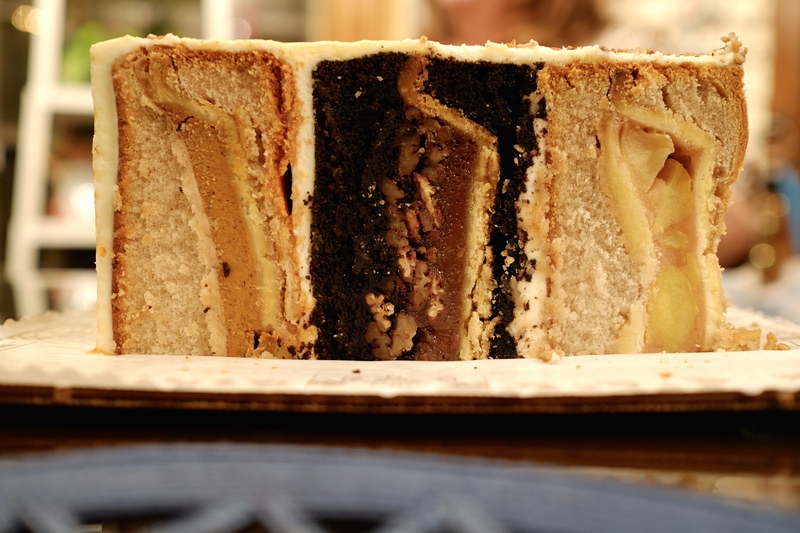 Is that pie inside of cake? Must have taken a long time to bake, with the variety of ingredients! For real. In a former career, I was a professional baker, so I’m curious and kinda want to try it at home. The big question that I have, how to keep the pie crust from getting soggy with all that cake batter. Looks much better than fruitcake that lots of people pass on to their family & friends at Christmastime, but I doubt anyone eats themselves. This cake looks rich & moist! Reblogged this on LA PIEDAD. ENCRUCIJADA DE CAMINOS. Looks a bit like chocolate/strawberry/vanilla ice cream – in cake form. Reblogged this on Andy Skelton. ı like desert. this is amazing! i think you should eat turkish desert. not sure I believe you – ship it to me?? Ah, Three Brothers is Legendary, in Houston and beyond! Sitting up here, freezing in DC and now you’ve made me homesick… I have to go bake something. This is a good type of dessert for someone who can’t decide whether they want cake or pie-a compromise!